We have been sent information about a new sculpture that has been commissioned by Andy Kay. Please see the detail below and photograph of the finished piece. We think it’s fabulous, if you live locally why not take a look in person!? This weary Shire horse is the latest sculpture to grace the Grand Union Canal. The life-size horse, created by Cumbrian sculptor Andy Kay, was commissioned as part of a £46,000 art trail at Great Linford, near Milton Keynes. 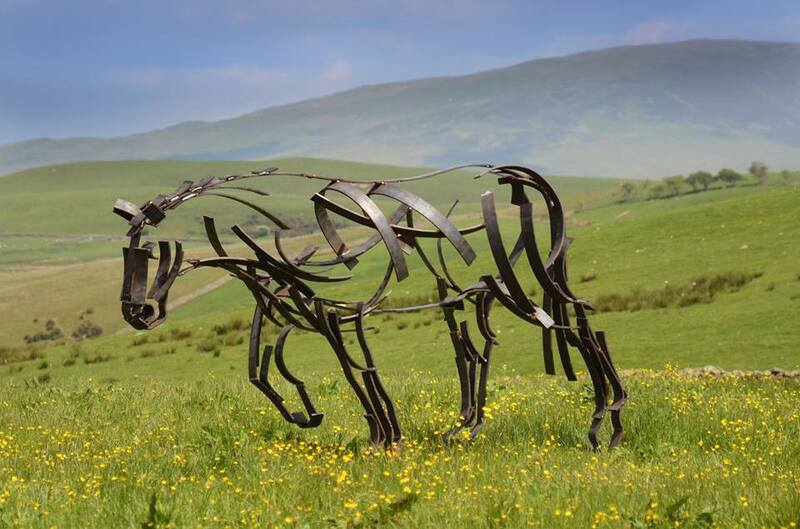 Made from dozens of pieces of steel, it is one of the sculptor’s first pieces of public art in the UK – most of his work can be seen in stately homes and overseas. “This has been a wonderful commission to work on. I have really tried to catch the nuances of an animal feeling tired after a long, working day pulling barges along the canal,” said Andy. The sculpture is one of seven being installed in a 1.3 mile art trail along the canal at Great Linford, near Milton Keynes, by the Parish Council. The trail is inspired by the former Japanese Gyosei School in the area, which in its heyday had 1,000 pupils. “I work with steel every day so it feels very fitting that I’ve created a sculpture for the Grand Union Canal, a key part of Britain’s industrial heritage,” said Andy, who is based near Kirkby Lonsdale, Cumbria. The Gyosei Art trail will be formally opened on July 17.